mahjongg, solitaire, tile game, freecell, spider, tile matchingJongg solitaire tile games found nowhere else. Games include MahJongg Spider, MahJongg FreeCell, MahJongg Gaps, and Four Rivers. With Pretty Good MahJongg you can play the classic MahJongg solitaire tile matching game, MahJongg puzzle games, and original MahJongg solitaire tile games found nowhere else. 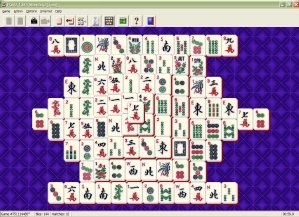 The classic MahJongg solitaire tile matching game begins with a layout of MahJongg tiles. The objective is to remove the tiles in pairs until you remove them all. Pretty Good MahJongg has 320 different tile matching layouts. The 55 MahJongg puzzle games and original MahJongg solitaire games include MahJongg Spider, MahJongg FreeCell, and MahJongg Klondike, which are new tile games based on solitaire card games. You can also play MahJongg Gaps, Crazy Quilt, and the Pyramid of Wild Dragons. All of these are new original games played with MahJongg tiles. Play the classic MahJongg puzzle games of Four Rivers, MahJongg Stones, Great Wall, and many others. Pretty Good MahJongg brings a whole new look to MahJongg solitaire, with games and ideas from solitaire card games never seen before with MahJongg tile games. ongg Spider, MahJongg FreeCell, and MahJongg Klondike, Four Rivers, Great Wall, and MahJongg Stones.